Welcome to House Full of Summer! I am so excited to be joining some very talented bloggers on this Welcoming Fall Home Tour. All of the participants sharing their homes with you are linked at the bottom of this post. If you're visiting from Eggshell Home, thank you for joining us! I've been in Florida for three years now and my Fall decor is ever evolving. 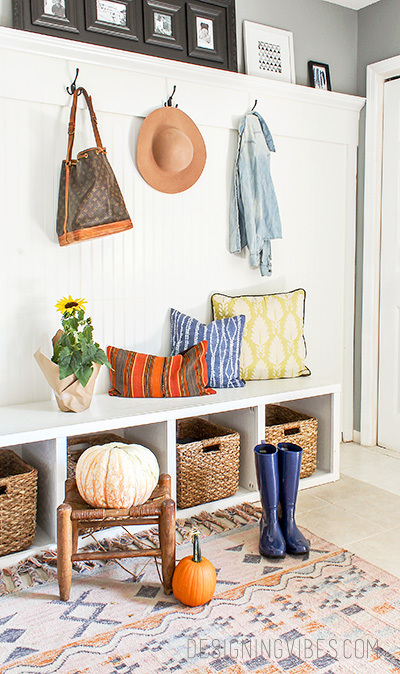 The first Fall we spent in our home was consumed by wedding planning (we got married in October) and the second Fall was just an emptying of my Fall decor bin and placing random fall accessories wherever I could find a spot for them. We didn't even have furniture in our front dining and living spaces, so it was quite sparse! Now, our third Fall in this home is starting to feel a bit more magical. I feel like I've found my sweet spot when it comes to making our house feel like home, and it all starts with bringing those beautiful outdoor elements inside! Nothing says "Welcome!" like a little humor. Door stop found at HomeGoods. White pumpkins are my favorite. They go with everything, so you'll see them pretty much everywhere! These all came from Michael's last year. I'm waiting for another sale to get even more! Can you spy my fresh greenery from the yard? Hint: it's now white. 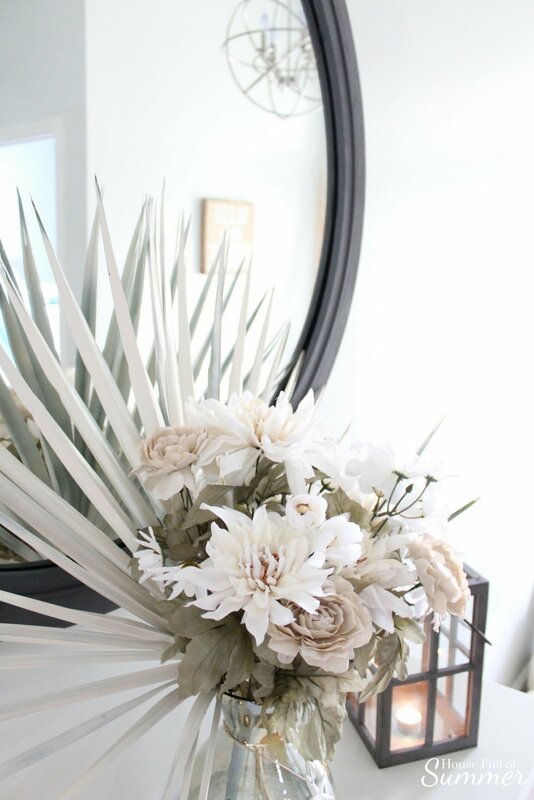 A can of white spray paint transformed vibrant green palmetto fronds into a fun base for my neutral floral arrangement. The afternoon light peeking in through the front door is my favorite! Toss a few pillows and a throw on the ottoman and we're feeling cozy! I love that both the massive pine cone and palm fronds came from my yard! 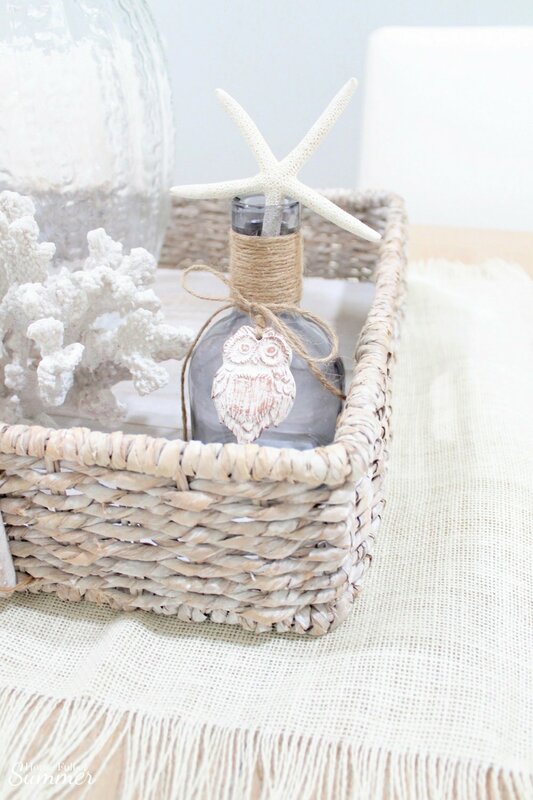 This table is one of my FAVE HomeGoods finds! Luckily for you, I've found it online for you to order! ;) Shop my home at the bottom of this post. Bringing in bits of what Mother Nature has to offer is my favorite way to decorate. 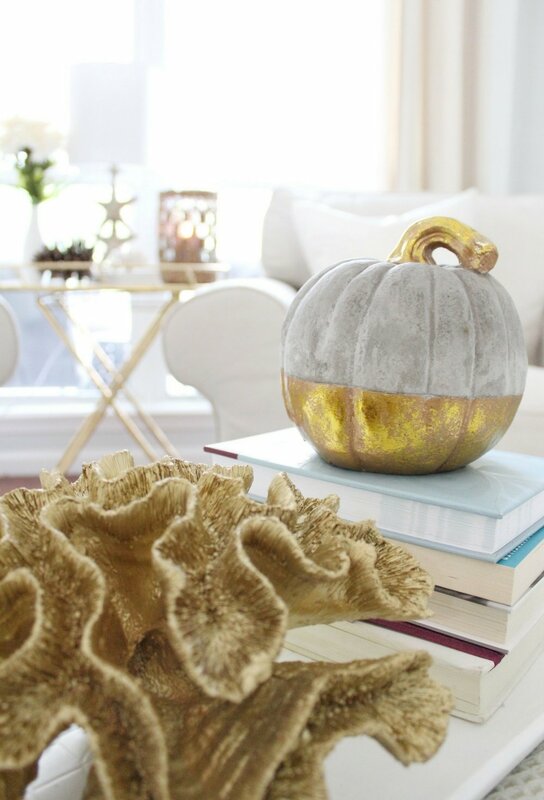 Love this dipped gold pumpkin! Another score from HomeGoods that I've found online for you!! Gold coral + gold pumpkins. That's how we do Fall in Florida. These delightfully fluffy reeds also came from my backyard. Bonus: they've lasted for a month so far! Can one have too many throws? I can't get enough of these tall grasses! They are even fluffier in person. Got two dozen gorgeous white roses for only $5! There is a man who comes to our office to sell his rose garden surplus every few months, and I always grab them anytime they're available. Who says roses aren't for Fall decor? Not me! 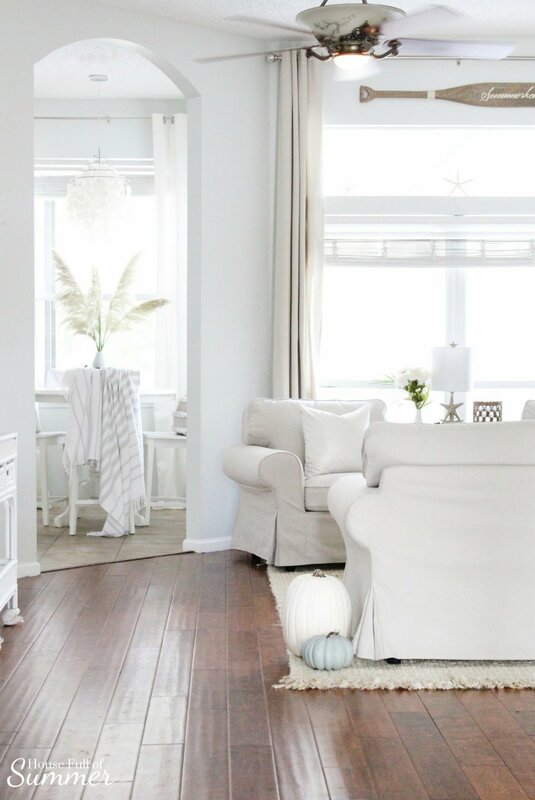 These neutral tones and flowers are a great way to deal with the fact that it's still 90 degrees and sunny outside. I love a seamless transition from season to season. No lights are on in this room, but our sky tunnels really light up the space. This chandelier is evolving from what used to be a dark iron colored metal with hideous golden, frosted glass shades. (My face is scrunching just thinking about them...ew.) It may get some DIY jewelry in the near future, so stick around for the final makeover. So thankful to have more natural light in our home! This room originally had no natural light and just the orange glow from the chandelier. 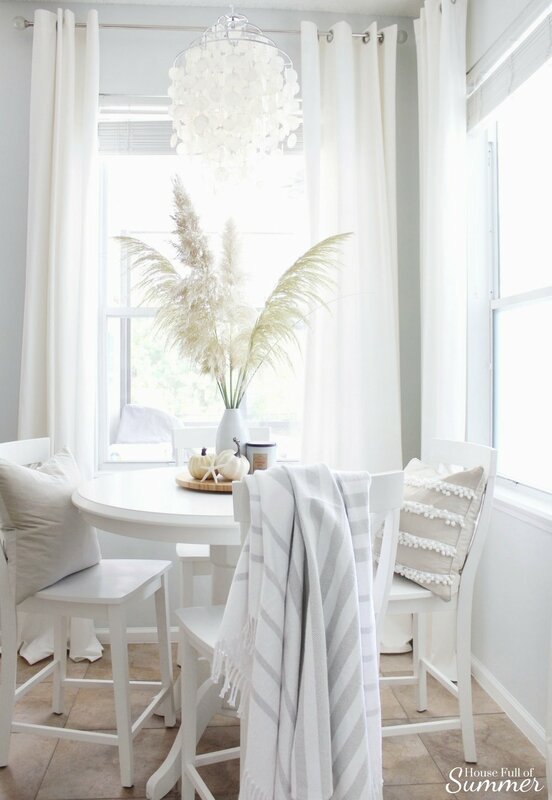 These magnolia trimmings are the perfect accent to any table. Starfish and owls, another Floridian-Fall pairing! Cinnamon broomsticks are a Fall staple at our home. The bedrooms in our home see the most color in decor. But I think navy is a neutral! Some magnolia leaves and pine cones make for a great natural tray filler. 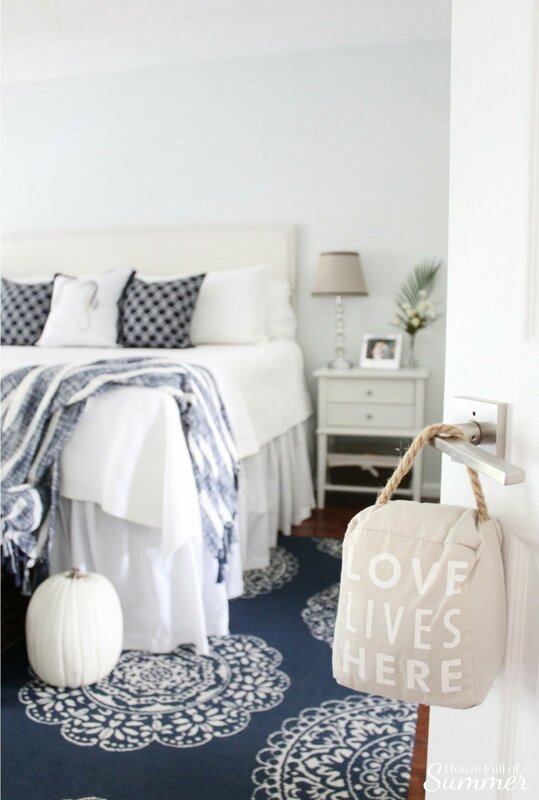 This rug has been such an awesome purchase for our bedroom. With our big dog constantly laying on it, it holds up so well! It's soft, but is actually an indoor/outdoor rug that I found on sale for under $100! Magnolia branches from the backyard last for weeks and are an easy transition into Fall. Thanks so much for dropping by! You can shop my Fall decor and other home items by clicking the button below. Affiliate links are sometimes used in my posts to make it easier for you to shop! I may receive a small commission if you use my links to make your purchases! Thank you for your continued support! 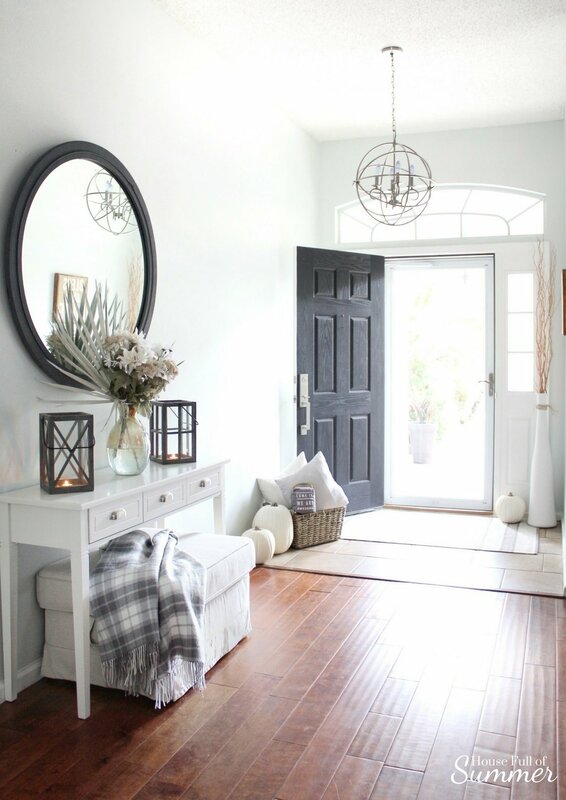 Head to the next home on our blog hop, Jane at Home, she has gathered so many lovely Fall vignettes for you! You can find the rest of the participating bloggers below. Oct 7 How to Save Money on Outdoor Living!